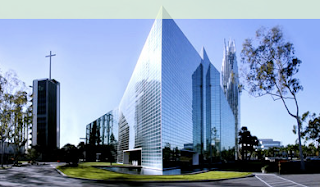 Last June, I mentioned the weekly "Hour of Power" television broadcast from the Crystal Cathedral, in Garden Grove, California. Its American founder, televangelist, pastor of the Crystal Cathedral and author known around the world is Robert Harold Schuller, (born September 16, 1926). Though we sometimes just say our prayers with no true understanding and respect, Bishop Kenneth Ulmer enlightened me about the 23rd Psalm. ... And 'though this may be "a strange place to be blessed" I am confident it will touch the soul who needs it most. That's the power of ministry.